Next year, election season will bring with it a painful reminder of the last time someone named Bush made us pay close attention to Florida.Â This weekendâ€™s movie recommendation, HBOâ€™s Recount, dramatizes the crisis of political legitimacy occasioned by hanging, lingering, and downright stubborn chads up to and including Bush v. Gore. The film was produced in 2008, and the same fascination with the fragility of politics that inspired the film then makes the film just as entertaining again now. The film begins once the electoral campaigns have already concluded, and whichever remaining Floridians still eligible to vote after surviving the stateâ€™s stringent restrictions designed to winnow out the â€˜undesirablesâ€™ are punching a hole next to their preferred candidateâ€™s name. Except that the layout of the ballot, thanks to an idiosyncrasy of design, meant that Pat Buchanan garnered an unusually high share of the vote (so much so that he himself conceded his numbers seemed to depart from even his own most ambitious projections). An embarrassing retraction of Goreâ€™s concession to Bush followed, and a bitter struggle ensued to figure out who truly had won the vote in Florida. The protagonist of the action, if itâ€™s correct to think in such terms, is Ron Klain, played by Kevin Spacey. As Goreâ€™s former chief of staff, Klain was tasked with coordinating the recount effort on behalf of the Democrats while Benjamin Ginsberg (played by Bob Balaban) does the same in his capacity as chief counsel to the Bush-Cheney campaign. Recount really gets going once the cast of characters is fully set, caricatures (more on that in a moment) and all. Although itâ€™s frustrating that in some instances the motivations are fairly straightforward (Ginsberg stands out in this respect), some other characters are a lot more complex and engaging to watch. Klain, in particular, undergoes a remarkable transformation from dogged strategist to fierce attack-dog to petulant lackey. Upon the filmâ€™s conclusion, heâ€™s not so much quixotic as he is just plain obstinate. For both Klain and Ginsberg, thereâ€™s a remarkable sense of prioritizing victory at the expense of the countryâ€™s weakening faith in the electoral process as a whole. Even in the filmâ€™s waning moments, as the Supreme Court issued its death knell to the Democratsâ€™ hopes, it took Gore to quell Klainâ€™s pursuit of recourseâ€”not the other way aroundâ€”to pronounce an end to the election. Recount was successful enough to incline HBO toward making another film of very similar ilk. Game Change (reviewed here), which deals with the embarrassment of Sarah Palinâ€™s Vice Presidential candidacy, pairs very nicely with Recount in that neither is outrightly partisan. With that said, Recount isnâ€™t shy about injecting a touch of humor and parody in an otherwise solemn story. Take, for example, the asymmetry in the strategies each team adopts. Some amusing editing does the heavy lifting here: James Baker (Bushâ€™s champion, played by Tom Wilkinson with bravura) frames the race as a â€œstreet fightâ€ that licenses his team to do whateverâ€™s necessary, because â€œthis is as political as it gets.â€ Cut to Warren Christopher (Goreâ€™s feckless champion, played by John Hurt), on the other hand, who comically announces that his team is to allow the legal process to work as planned and eschew anything that would reduce the race to anything deserving of lesser dignity than the occasion demands. But creative editing alone isnâ€™t the only part of Recount youâ€™ll find laugh-worthy. 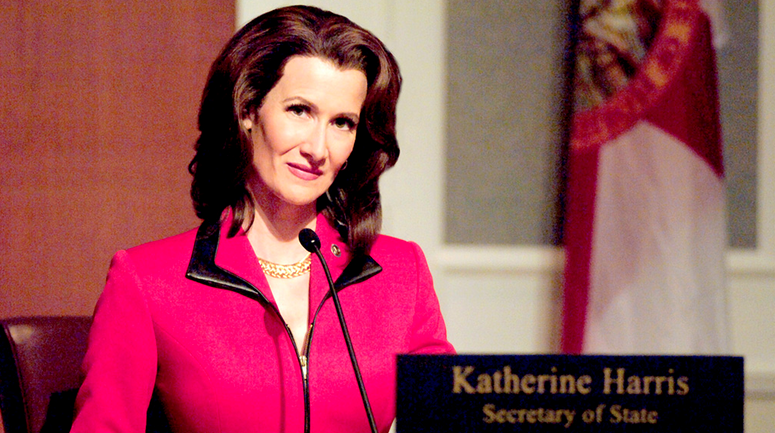 While most of the characters are relatively ordinary, Laura Dernâ€™s characterization of Katherine Harris (the head of Bush’s Florida campaign and the Secretary of State responsible for handling the media and electoral administration) borders on pantomime. The heavy make-up is one thing; her spineless capitulation to pressure from GOP advisors is another. If Game Change is the sequel to Recount, then Harris is the brightest and most continuous line connecting the two films. After all, in the dwindling legitimacy of the presidential election, itâ€™s Harrisâ€”like Palinâ€”who sees opportunity rather than tragedy. Another great choice! I was unsurprised to hear that James Baker liked this movie as he comes off in political terms as the hero (i.e., the most effective operative, well done Tom Wilkinson) and Warren Christopher comes off as the most naïve eminence gris in political history. One flaw of the film is that all these D characters talk about how much they respect Christopher and as a viewer you keep wanting to know why — he seems a classic bring a knife to a gun fight type of guy. And as for Dern, well, wow. She and Julianne Moore make people that they personally almost certainly hate understandable and even at times sympathetic. Strong acting indeed. One of the few times Spacey *wasn't* the best performance.